Walker, Alexander. Vivien: The Life of Vivien Leigh. Higham, Charles. Errol Flynn: The Untold Story. Hepburn, Katharine. Me: Stories of my Life. Jenkins, Garry. Daniel Day Lewis: The Fire Within. Cameron, Ian. Pictorial History of Crime Films, A. From Mommie Dearest to A Book, from	Agee On Film to The Films Of Mary Pickford, we can help you find the film books you are looking for. As the world's largest independent marketplace for new, used and rare books, you always get the best in service and value when you buy from Biblio.co.uk, and all of your purchases are backed by our return guarantee. 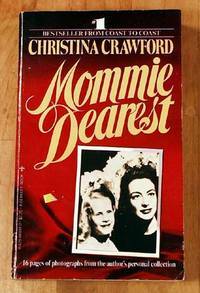 Mommie Dearest is a memoir and exposé written by Christina Crawford, the adopted daughter of actress Joan Crawford. The book was published in 1978. The book depicts Christina's childhood and her relationship with her mother. Four U.S. Navy SEALS departed one clear night in early July, 2005 for the mountainous Afghanistan-Pakistan border for a reconnaissance mission. Five days later, only one of those Navy SEALS--Luttrell--made it out alive. A screenplay or script is a written work that is made especially for a film or television program. Screenplays can be original works or adaptations from existing pieces of writing. A play for television is known as a teleplay. Hollywood Babylon is a book by avant-garde filmmaker Kenneth Anger which details the sordid scandals of many famous and infamous Hollywood denizens from the 1900s to the 1950s. First published in the US in 1965, it was banned ten days later and would not be republished until 1975. Upon its second release, the New York Times said of it, "If a book such as this can be said to have charm, it lies in the fact that here is a book without one single redeeming merit." Here is a lively, highly informative history of American movies that, as Professor Frank Freidel of Harvard writes, combines "social history, economics and a precise and effective sense of film criticism." Movies were the first twentieth-century mass medium, and largely by chance, the first big American movie audiences and moviemakers came from the immigrant, working-class segments of the population. Movies therefore became a challenge to American big business and American culture, both of which had been controlled by the Establishment. This, Sklar suggests, is one reason why, from their very beginning, movies have been hounded by censorship. This book does three things: it traces the influence movies had on American society during the years when innumerable Americans young and old modeled themselves and their behavior on their favorite movie stars and movies; it shows the effect of the movie industry on the American economy; and it offers fresh and provocative interpretations of such movie milestones as D. W. Griffith's early epics, silent comedy (Charlie Chaplin, Fatty Arbuckle, Buster Keaton, Harold Lloyd), the two golden ages of 1930s movies, Walt Disney cartoons and Frank Capra's social comedies. It explains the movies' downfall in the 1950s, which, Sklar contends, was not due solely to television, and it suggests the movies' possible future. Exploring simultaneously Hollywood aesthetics, economics and culture, it offers a fascinating, comprehensive picture of the role that movies have played in American life. Born Standing Up: A Comic's Life is a memoir, released November 20, 2007, by Steve Martin, an American author, actor, comedian, executive producer, playwright and screenwriter. It chronicles his early life, his days working for Disneyland, working at low tier coffee shops and clubs as a comedic act, his later days of the Bird Cage, his relationships, his eventual fame, and the reason why he quit standup in 1981 all together. James Agee (1909-1955) started his writing career as a reporter for Fortune, which led to his writing Let Us Now Praise Famous Men. In addition to film reviews, he wrote several scripts, including The African Queen and The Night of the Hunter. He won the Pulitzer Prize for his novel A Death in the Family.